These permanent markers feature two different style nibs that give the artist flexibility - one end has a broad (wedge) nib and the other a fine nib. Alcohol-based permanent ink is low-odor and will not bleed. They are available in primary colors, mid-tones, grays and metallics. Metallic colors come in single nib markers only - fine and broad. These permanent 4 in 1 PRISMACOLOR® markers feature two different style nibs that give the artist flexibility - one end has a broad (wedge) nib and the other a fine nib. Alcohol-based permanent ink is low-odor and will not bleed. Sanford Prismacolor double ended Markers (formerly Berol) are available in primary colors, mid-tones, grays and metallics. Prismacolor metallic colors come in single nib markers only - fine and broad. 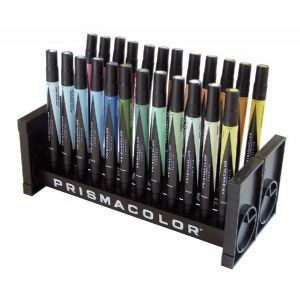 Prismacolor Art markers deeply discounted to meet any budget!